When European settlers first came to the Buffalo Hart area in 1824, the most noticeable feature of the landscape was a large grove of trees surrounded by prairie. Most of the early residents built their homes on the edge of the timber. 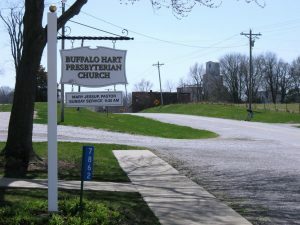 The first religious service near Buffalo Hart was held in the summer of 1826, two years after the first European settlement in the area. A traveling Methodist Episcopal minister held the service; his congregation amounted to four adults and four children: Mr. and Mrs. Robert Burns and Mr. and Mrs. James Lynn and their four children. Other early residents included John and Susan Constant, Robert and Mary Cass, the Ridgeways, the Starrs, John and James Robinson and the Greenings. 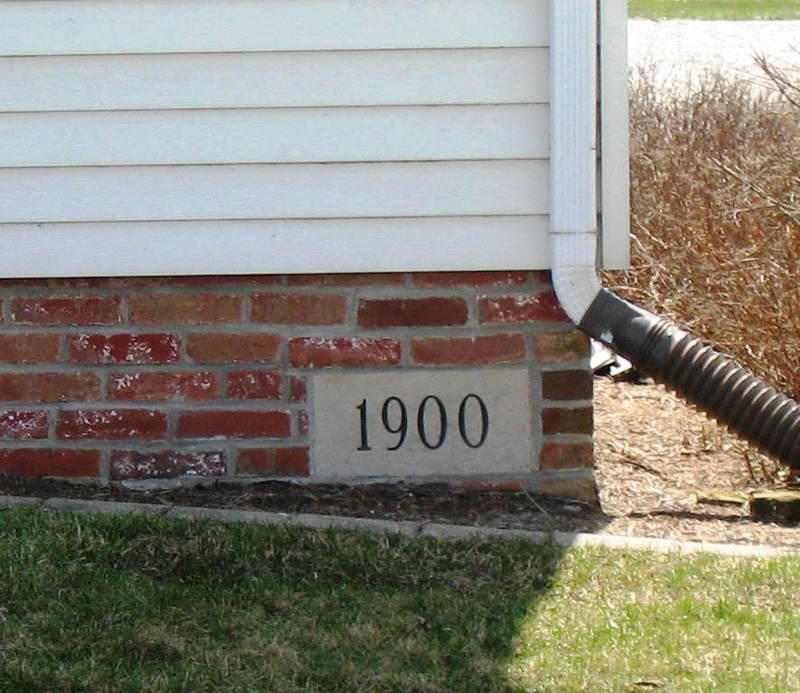 The Enoses and several others came in the Spring of 1831. All the religious services these families had were held in their homes by a traveling minister when he came through the “Grove”. Dr. Barton Robinson, a brother of James Robinson, built Buffalo Hart’s first frame structure, a church called “The Chapel,” in 1832. He built it to be used by the Episcopalians, but there were not enough people in the community of that faith, so it was then used by all faiths and later purchased by the community to be used as a school and social center. The “Old Chapel” was 24 by 36 feet with a clapboard exterior. The interior had a puncheon floor with a two-foot-high platform across the front. 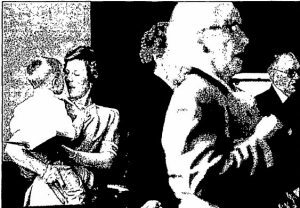 The building was heated by a wood stove; women and children sat on one side, the men on the other. 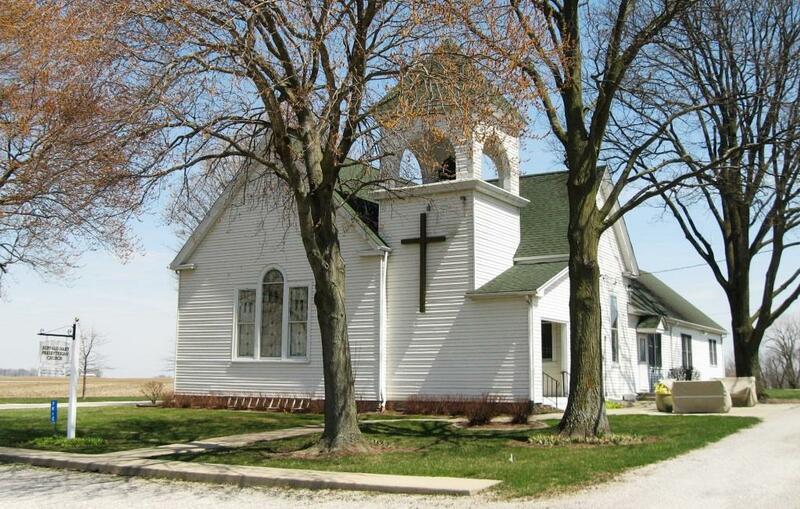 Church services were held on any Sunday when a traveling minister or circuit rider came to Buffalo Hart Grove. In the 1860s, four denominations – Baptist, Christian, Methodist and Presbyterian – built the Buffalo Hart Union Church. It was dedicated in August 1867. The church’s trustees – one from each denomination, plus a fifth – were responsible for enlisting ministers for Sunday services. The preachers would arrive by train at Buffalo Hart, or, if one lived near enough, he would drive or ride a horse to the service. Buffalo Hart members of the Lake Fork Predestinarian Baptist Church joined the Buffalo Hart Union Church in 1871. For the last few years of the Union Church, its minister was a Presbyterian, Rev. Simon Benson. He held services there every other Sunday while serving Williamsville Presbyterian Church on the other Sundays. Finally, in 1896, Union Church Presbyterians petitioned to organize a Presbyterian Church at Buffalo Hart. The petition was granted, and the church came into being on May 16, 1896. Benson continued to serve the Buffalo Hart and Williamsville Presbyterian Churches until April 22, 1898, when he was succeeded by the Rev. John Roberts, who similarly alternated Sundays between Buffalo Hart and Williamsville. Roberts also argued for construction of a new church at Buffalo Hart Station, and the congregation voted 19-3 in favor of the plan on June 27, 1900. The building was financed via a $500 loan from the Presbyterian Board of Church Erection, the sale of the Dawson Presbyterian Church and individual donations. Robert Cass contributed a half-acre of land as the construction site. The church was dedicated in October 1900 with 63 members. Hitching racks and a wooden walk south toward the Buffalo Hart general store and rail stop were added in 1901. Box socials, ice cream suppers and strawberry festivals sponsored by the Christian Endeavor Society raised the $75 needed to buy a bell for the church in 1902. For most of the next decade, services continued to be held two Sundays a month. They were conducted either by ministers shared with other area churches or seminarians. The celebrants typically arrived on Saturday, stayed all night at the home of church member F. L. Priest, and departed on the train after services on Sunday. Sunday School was held every week. Much of the social life of the community centered around the church and church societies. For several years, lawn socials were held each month, with different families taking turns entertaining at their homes. During World War I, the church was used as a Red Cross center. The red carpet in the Sunday School room was taken up so the room could be cleaned easily, and tables were moved in to be used for rolling bandages and cutting out hospital supplies. An auction was held on the church lawn for the benefit of the Red Cross. Grain and livestock prices were at an all-time high, so farmers were prosperous and bid liberally at the sale. A rooster sold for $25. All eligible young men from the church and community were in service; some were overseas. Buffalo Hart’s West Side School burned in November 1926, and the school term was finished in the church. The first four grades were housed in the Sunday School room and the upper four grades in the sanctuary. On April 19, 1927, a tornado struck Buffalo Hart, killing three people, including two children from the same family, and causing severe damage throughout the area. Although the storm damaged the upper part of the church, including blowing out its leaded stained-glass windows, children attending school in the basement were uninjured. “They were … consoled during the terrific gale by J.L. Brubaker, Springfield, the teacher,” the Illinois State Journal reported. Among those left homeless were timber workers, who were clearing nearby woods and milling the timber, and their families. Dozens of them, many injured, lived in the church basement for several weeks. The Red Cross provided clothing and helped refurnish the rebuilt dwellings. In the aftermath of the storm, the church’s windows were replaced, the walls papered, the floor painted and a new carpet installed. As usual, the Ladies Aid, members and citizens of the community helped. Reconstruction was financed partly by a play that was presented in the hall above the Buffalo Hart store. Gas lights were installed in the church in 1936. The Rev. F. L. Smith of Fancy Prairie became Buffalo Hart Presbyterian’s first resident minister in 1940. At first, a house was rented for him, while church members raised $3,500 to build a parsonage in the churchyard. Building materials, however, weren’t available because of World War II. Instead, in 1944, the church bought the W.O. Cass property – a house and 20 acres of land – south of Buffalo Hart. The house was converted to the church manse, and the Smith family moved in. Farmers in the community, under the direction of the trustees, farmed the land and the proceeds were put in the church treasury. That arrangement ended in 1990, when the land was divided into lots and sold. Electric lights were installed in the church in 1947, a south entrance was constructed in 1950, and three new Sunday School rooms were dedicated in 1957. The entrance was rebuilt and redecorated in 1970, when the double doors on the west side were removed and new doors installed in the south entrance. The Farm Progress Show, an agricultural exhibition sponsored by Prairie Farmer Magazine, was held from Sept. 30 to Oct. 1, 1969, on the nearby James Cravens farm. Churches in the surrounding area were invited to help serve the food. Buffalo Hart Presbyterian was the host church. Proceeds were $5,265, most of which was spent on improvements to the church. The community celebrated its sesquicentennial on Sept. 15, 1974, with the Rev. Lewis Andrew in the pulpit. In 1975, the congregation had 104 members and a budget of $7,660. Over the next two decades, membership fell steadily, to as few as 27 people. In the early 1990s, with the remaining members concerned about whether the church could continue, the Rev. William Schacht, a rural ministry specialist, surveyed the area for new members. In 1993, however, one of the church’s youngest members, Janice Kennedy, undertook a promotional mailing to 5,000 households in northeastern Sangamon County. Kennedy had begun attending Buffalo Hart Presbyterian in 1987, attracted by the welcome she received. “People came up and introduced themselves and invited me back. It was so warm and welcoming,” she told State Journal-Register reporter Elizabeth Bettendorf, who wrote a feature story about the church in April 1993. The immediate effect of Kennedy’s letter was modest – one family joined the church – but it signaled the beginning of a rebound in membership. The year 1993 also was when the Rev. Mary Jessup became Buffalo Hart Presbyterian’s part-time pastor. Jessup was still pastor in 2018, making her by far the church’s longest-serving minister. As of 2018, according to Jessup, the church had 90 members and a weekly average attendance of 54. With Buffalo Hart Township, Buffalo Hart Presbyterian Church today co-sponsors a community picnic that draws more than 150 people annually. Myrabel Theobald updated the church’s history when Buffalo Hart Presbyterian celebrated its centennial in 1996. Her conclusion still rang true in 2018. Our first century has seen many changes in our small country church and the community, but the church still stands as a place of worship for all. Our forefathers could not have envisioned the exodus of young people from the community as farms became larger and larger and farmers fewer in number. Most have been educated to other fields and occupations and have relocated from coast to coast. Many have become active in churches in other communities. Many return for visits from time to time to make contact once again with their religious roots. Through good years and bad the church has remained – rejoicing in the good years and consoling each other in the bad times. We continue to welcome new members and to value those who have been with us longer. Editor’s note: This entry is based on a history of Buffalo Hart Presbyterian Church compiled by Dorothy Burrus in 1974, with an update by Myrabel Theobald in 1996. Parts also were written by May Enos. SangamonLink also consulted State Journal-Register archives. The full Burrus/Theobald history can be read here. Hat tip: To the Rev. Mary Jessup for inspiring this entry and providing additional information. This entry was posted in Churches, Historic Sites, Social life. Bookmark the permalink.